Our Sugar Free Kalakund is perfect for people who are diabetic and yet want to enjoy Indian mithai. 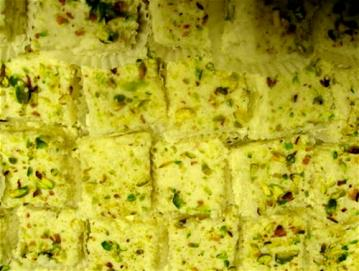 It is one of our most popular Bengali sweet creation and Highly recommended Sugar free sweet. This kalakund is packed with alluring textures, juices and flavors. It is extra soft, lightly sweetened by Splenda. It is refreshing and delicious with an airy texture. Biting through the textures of the sweet give varied flavors. Another Bengali Classic: guarantee to simply melt in your mouth as easily as if it were made of butter with a soothing feeling. Major Ingredients: Low Fat Milk, Splenda and Garnished with sliced pista. Note: *Shipping travel time must not exceed more than two days for this item to keep it fresh. Buy Bengali Kalakund (Sugar Free Indian Sweet), 1 Pound, sold & shipped by Bengali Sweet House where you can shop online for Quality Indian Sweets, Snacks & Gift Baskets Shop - Bengali Sweet House. This Indian Sweets collection has been tagged as kalakund, indian sweets, gift box, fresh mithai.